I am blessed with some really, really wonderful friends. Let me share with you a little bit about 2 of them. "My" Sandy was my babysitter from the time I was 6 weeks old up until I went to school. I was the flower girl in both of her daughter's weddings, went on vacations with their family, babysat the grandchildren, and so on. They are all like family to me. My Sandy loves the color red. 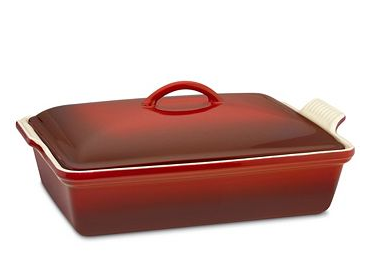 I couldn't help but think of her when I selected red for my first Le Creuset item, setting the standard for many more items to come! Just a few weeks after I made that purchase I opened my front door to a package marked "Chef's" on the side. What a fantastic surprise it was to find a red, rectangular Le Creuset covered casserole dish from My Sandy inside! I was so excited, thrilled, and especially touched to have received such a nice gift from My Sandy, thank you so much! Another good friend of mine is Deanna. She's also Pittsburgh girl who lives in Hawaii. She was a pierogi with me for Halloween, demanded that we have our own fish fry, and even re-made my upside down pizza casserole and sent me photos. Deanna volunteered to take care of my cat, Bagheera, for my upcoming trip to the mainland. Being one of my blog's biggest supporters, Deanna read the cannoli post and admitted to me that she's never seen the Godfather. Could we still be friends? Yes. Although she had to see it, and right away! Today, Deanna came over to meet Bagheera, watch the Godfather, and grub! I used my fabulous new casserole dish from My Sandy to make dinner for Deanna. Good ju-ju all around! Using the Wiseguy Cookbook, written by Henry Hill (the guy that Goodfellas is based on), I made (with some small changes) Stuffed Shells with Tomato Mint Sauce. I've always wanted to make stuffed shells, which are one of my Mom's specialties. The mint in the sauce is what really sold me on this recipe. 1/4 cup fresh mint leaves From the plant on my porch! 2 teaspoons dried parsley During my next trip to Home Depot I'll get a parsley plant! Cook the shells until barely al dente and drain well. Mom told me to lay them out flat to prevent them from sticking, so I did. In a large skillet, heat olive oil over medium-low heat. Add garlic and cook briefly, stirring. Add the crushed tomatoes and tomato sauce and stir well. Add mint and parsley, salt and pepper. Cook over medium-high heat until sauce begins to bubble. Stir well, then lower to a simmer. Cook for 30 minutes while you stuff the shells. Combine cheeses (ricotta, mozzarella, and Parmesan) in a large bowl and add beaten egg, parsley, and salt and pepper. Spread a small amount of tomato sauce over the bottom of your fancy new casserole dish enough to hold the shells in a single layer. Fill shells with the ricotta mixture and place in dish. Bake for 20 minutes until heated through. Mangia! These shells were amazing and the sauce was even better! I'll never make sauce without mint again, no lie. The mint was such a refreshing pop of flavor in the sauce and really added to the overall taste of the dish. My Mom's stuffed shells have spinach in them and I didn't miss it at all. Mom, if you're reading this, forget the spinach! The three cheeses were such a great combination, tucked so neatly inside the shells. The sauce and the shells were amazing! When you said you were making stuffed shells you definitely "made me an offer I couldn't refuse". I can't wait until part 2 and 3 of the Godfather! Also the strawberries are my new favorite thing. PUT SPINACH IN THOSE SHELLS!!!! Nooooooo! They were great without spinach.